Summer or winter, our need for Vitamin D is often far greater than we are getting. Researchers now know that previous recommendations for optimal levels of Vitamin D were much too low! 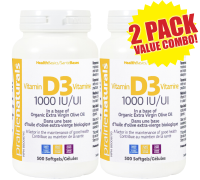 Vitamin D not only helps strengthen bones; Vitamin D also protects against dementia, depression, diabetes, obesity, certain cancers and MS. Prairie Naturals Vitamin D3 is made with cholecalciferol, the most readily absorbed form. Be sure you get enough of this low-cost, highly valuable vitamin. You’ll soon feel the difference that Vitamin D makes to your health and happiness. A base of organic olive oil enhances absorption.